Is there an exercise that can boost feel-good chemicals in your brain while reducing anxiety and improving your mood? The answer is yes – it’s yoga. Now yoga isn’t the only exercise that’s been shown to be effective in reducing anxiety, but Chris Streeter, MD and her colleagues from the Boston University School of Medicine conducted a study that compared the efficacy of yoga to walking. 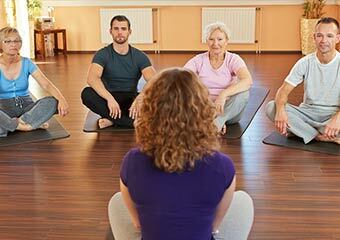 Next, researchers randomly assigned participants to either a yoga group or a walking group. Each group did their respective exercise three times a week for 60 minutes over the course of 12 weeks. Participants’ brains were scanned before and after the 12-week intervention, and anxiety and mood levels were measured throughout the duration of the study. The results showed that the yoga group experienced significantly greater improvements in mood and anxiety, and higher levels of GABA than the walking group. What’s special about this study is that it demonstrates that an exercise intervention (yoga) can increase levels of GABA in the brain and also bring about better mood and lower anxiety. It’s encouraging to see brain science validating the therapeutic value of mind-body approaches like yoga. Anti-anxiety medications work, in part, by affecting GABA levels in the brain. This study shows we can also do this naturally with yoga. 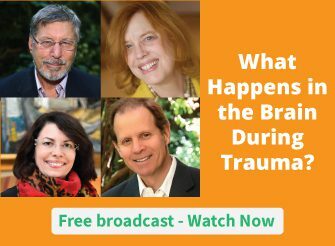 And at The Trauma Center in Brookline, Massachusetts (founded by Bessel van der Kolk, MD), yoga is one of the innovative treatment strategies being used to help patients who have experienced trauma. You might recognize Bessel as a frequent contributor to our programs. And if you’d like to find out more about the study, you can find the article in The Journal of Complementary and Alternative Medicine. Have you ever used exercise or other body-oriented approach to help reduce anxiety, improve mood with your patients, or as an intervention for trauma? Please leave a comment below. Cool. My memory is really bad this time even I’m just 28 years old. I need to practise my brain more and more. I began having epileptic seizures in my mid-thirties. I’m now 49 years old. I had dedicated my life to the art of dance, so always carried with me a comfort with movement. I’ve choreographed extensively. My mission as an artist, “to explore substantive subjects through dance”. I didn’t learn to dance because I’m a rich girl from the suburbs. I learned to dance because I’m a poor, but eccentric girl from a small town where everyone knew everyone’s business. There just happened to be a retired dancer from the New York Ballet who lived there and operated her own studio. She offered me free dances classes throughout my childhood. I was the ONLY child in town who took classes. Dance played a vital role in my survival as a child and an adult because it offered me a place to go for healthy comfort throughout my life. It has played a vital role in helping me forge a healthy walk with illness. Yoga has been one of the best therapies for epilepsy. I describe this in more detail in my book, SEIZED – Searching for Health In the United States. Namaste. posts here eardly in the dawn, as i love to find out more and more. I lost my husband of 25 years to Altheimer’s Disease. It occurred gradually over three years. It has been very stressful. I am stuck and at times overwhelmed, having clarity then bouncing back to the loss of my special husband. I am attending a professional development tomorrow through NICCI about Emotional Focused Forgiveness. It is my hope to be able to take time to understand more about the complicity of my husband’s illness, find solace in the grieving process and to let go of what has been so difficult for me to let go of. I will also like to say that most people who find themselves devoid of health insurance are usually students, self-employed and people who are out of work. More than half with the uninsured are under the age of 35. They do not come to feel they are looking for health insurance since they are young and healthy. Their income is normally spent on housing, food, and also entertainment. Lots of people that do work either whole or in their free time are not given insurance by way of their jobs so they move without as a result of rising tariff of health insurance in the states. Thanks for the suggestions you talk about through this blog. Yoga as i undestand is much more than yoga poses or breath work.It is based on spirtuality /or aphilosofy of relationship guding our relationship with self,others including nature.I try to integrate this in my work with clients to help them feel “capable”( capability as conceptualized by Amirta Sen).II do find it effective in many cases….some of my client need a different approach. I recall a young man who had significant anxiety, including panic attacks who showed remarkable improvement within 2-3 weeks of starting a program of 45 minute brisk walk about 3 times a week. Of course, we were also doing CBT, but had had limited progress in symptom control until he included the physical dimension. He was the first of many to show the benefit of aerobic exercise in the treatment of mood disorders. It’s fascinating that yoga is also showing that. So it appears that the aerobic component is not necessarily the key. In my journey with trauma and post traumatic exoerience, and my subsequent work with the arts and trauma, with balkan refuges, various populations, with disease and forming a national cancer arts in medicine program and graduate certificate program at provost level with integrations the utilization of arts into their rofessional expertises, i experienced profound boldiky symtoms and studied early on meditation, tai che, massage theraoy and many body mind disciplines, it was however the base in experiential anatomy and physicology of bonnie bain ridge cohen, body mind centering, that gave me a conscious entrance and body mind language of how trauma effected our balance in all the body systems. There is a padticulat approach, and simple tch ique for releasing znd repatterning the neevous system by going i to the spine and spinal fluid, and allowing the gathering back i to the soine of held and complex holdong paths and contents, when understood on the body level, to gather and the. Central neevous system level reintegrates and patterns. I was able to utilize this for myself and others, to release without constant reliving and reczpitulation so much of early understandings of symptoms and therapeutic practices. The more grou ded in body and bodymind and more developed sense of bodymind as one phenomena not two, but the third that arrives as integrated respond, the easier it became for me and others to heal naturally. To reactivate natural pathways and re awaken the original senses. Our motto then was, in healing, if you can even approximate the evolutionary pathways, the organism will leap in. This is the deepest sense of healing. The arts can speak more directly to,this, as an organizing principle, than other mdoes of knowing. This was my work for over forty years. While i am glad to see us introducing the brain info, there is something not quite correct a out the way we are doing it. It remains singular thoughts, studies and insights, and practices xerived on this are not keeping up with the many inroads that people like Bessel have made into understanding this newer understanding that trauma is an effort to understand a form of suffering that has not been recognized. It feels like a rather strange effort to fall back i to science provides validity when the practice of therapy as interacticd of bodymind as one whole and experience was providing us a v alidty and a dialogue of impact with science, practice as human interactinal and the arts as expressive pathsways activating and renewing a healing force already at work with our human evolution. I do,hope you take this all into account, i feel like we are going a bit backeards when we need new science, not yet articulAted in either depth or. Omplex relationships to say, hey this rpvoes you can practice, lets add this. Se are loosong the gruly phenomenal sense of living and lived i quiry into the recealatins we are always pArticipating in , in an ongoing formative way. And thanks for asking, i am sure others have a feeling and. Iew of how you Are moving to keep us up to date. Thank you for all,your efforts. Rather than creating classes that are pose-oriented, the Kaiut method consists of subtle movements developed through tested sequences that work toward easing the aging process. Francisco (founder) specializes in treating complex injuries and chronic pain. I greatly admire the work that you do in mind body brain research and have used the materials you have provided in helping to treat my patients. I have even practiced yoga in classes with Dr. Streeter and Dr. van der Kolk who, along with many others, know first hand of its benefits. I am proud to count Chris Streeter M.D. as a friend and colleague having recently heard her lecture at the Yoga Research Society in Philadelphia and the Smithsonian during the excellent program “Yoga and the Art of Transformation” highlighting yoga and its role in evidence-based science of medicine. I experienced a spontaneous Kundalini awakening two years ago. It lasted 17 months. During this time my body did automatic yoga type movements. I have continued with my own “personalized yoga”. The movements have been the basis for tremendous healing (sleep, posture, digestion issues, stress, back pain, emotions) Over the past two years, I have transformed my entire life including relationships, career, and health. I can’t believe the difference and I would recommend yoga to everyone. I have been a Feldenkrais practitioner for 11 years, as well as a Sounder Sleep teacher. I am working toward my Masters in Counseling, planning on specializing in trauma counseling. The Feldenkrais Method © (www.Feldenkrais.com) is based on a synergy of principles of Child/Human Development, movement principles inspired by martial arts (in particular, Judo), and principles of Neuroplasticity. The approach is Holistic in nature. In my Feldenkrais work, I taught group classes and gave individual lessons, working with clients to enhance their awareness of their physical movement patterns and habitual thinking patterns. Students are taught to become aware of and redirect their habitual patterns of moving and thinking. Many of my clients had chronic pain conditions, such as fibromyalgia, chronic back or other muscular pain, as well as anxiety, including panic attacks. Sounder Sleep © was developed from principles of the Feldenkrais Method © and is specifically designed to teach skills people can use to retrain themselves to go to sleep. I (and other practitioners) also found these methods to be particularly significant and effective for people with anxiety, as well as people who have difficulty breathing. I believe my experience with both of these modalities will be very transferrable to working with those with PTSD and trauma, as well as with anxiety and depression. The first yoga class I took brought striking change in my chemistry and mood. The next day I repeated the entire sequence with my two toddlers climbing all over me. I was unaware that my husband was silently watching me. When I was finished, he said, “You’re never going to be the same, are you.” “No, I don’t think I am,” I replied. “Then I’m leaving you,” he said. Okay, I said. The next week he came back and asked, “Have you had enough?” “No, this yoga feels really good to me,” I said. We divorced, after ten years of torturous marriage, and a year later I began teaching yoga, soon teaching 15 classes a week. My students said they got more out of their hour of yoga with me than with their psychologist. I taught yoga straight out of the sensations in my body, which later gave me instant access into the genius of SE and other body-centered trauma specialties, including TRE, which is now teaching the yoga world how to shake off stress in the postures. I’ve been recommending, encouraging and assigning exercise as a primary intervention for both anxiety and depression for years. Now I’ll recommend yoga as well as cardio. Growing up in the 60,s, I , fortunately , was exposed (in elementary school ) to the positive benefits of using exercise to propel me through a crisis and elevate my mood. My mother reinforced physical fitness in our home. She watched ( me too) Jack LaLane and his dog, Happy. My elementary school employed 2 fresh-faced college grads in physical education .President Kennedy was leading the way with a Physical Fitness Initiative. 1964-1966. Information was everywhere. Physical activity, combined with mental focus is a very healthy endeavor. Meditation had come to the states. This all resonated with me and I have employed the use of exercise, nutrition and meditation to navigate life. I am 61.5 and still healthy. I hope we can teach children these concepts to improve quality of life and consequently, improve society. It is nice when there’s scientific research to validate what we suspect from clinical work and grounded people have known. I think it is important to let clients know there are different ways to practice yoga and while they may not enjoy one type there are other ways. Transitioning is also important. Jarring a system to a slow, calm, quiet yoga class might be too much but having a good experience with gentle stretching, power yoga, etc might engage them more. As an intense aerobics person during the 80’s and 90’s I cringed when my mother would espouse the benefits of yoga…I got older, wiser and found some yoga classes I found enjoyable and I’ve been practicing ever since. I worked with combination of subtle movements, yoga, dance, music and colour therapy with groups and also training people to teach Dancing the Rainbow, for twenty five years. The combination of intuitive movement, subtle energy work, yoga, music and working through the body’s systems in a safe group was life changing for many people. We worked with the chakra system for example; connecting with the animal body in the base chakra and moving with the fight, flight, freeze response. It also allowed people to become more creative and spontaneous, painting, writing, dancing, singing and playing drums and other instruments. For many this was a powerful way of connecting with a tribe of like minded people where they could express themselves through movement and voice. You can read about this in my book Dancing the Rainbow, Holistic Well Being Through Movement, Mercier Press, there are many exercises and music recommendations that you can use with your groups. We always found beautiful places to dance and eat nourishing food that had all the colours so healing was holistic in every way. Is Shalynn living in Singapore?I want to see her, too!Jason, I’m also dtneraoicg the room your sign that you gave me.Thank you! You are nice guy! Tai chi (taichiwuxigong) is very powerful. The form I follow repeats (single) movements during some minutes or longer and focuses on the body reactions. Relax the body, the muscles. The focus is on doing instead of result. It’s the exercise , the movement and it’snot about ‘ doing your best’ . So I would sugggest to look in to Tai chi / chi gong as well as already was mentioned. I do believe in physical exercise in reducing anxiety and stress levels, but I have never used yoga to do so for my myself, or with patients. Thank you so much for this article Ruth. Now we know why yoga has taken off in the western world. We feel less anxious and this study proves what we’ve known all along. I’d like to point out that Dr. Bessel van der Kolk is the keynote speaker at the Canadian Energy Psychology Conference in Victoria, British Columbia in October. For anyone interested the website is http://www.epccanada.ca and the Early Bird fee deadline is Juy 30th. Thanks for all the great information you are sharing. It keeps me current. Yoga is an actual mindful practice that keeps one focused on the breath and movement, especially when working with a good teacher. It is a mindful meditation in action. Sometimes I think I should take before and after pictures of participants taking even the most gentle classes. The calm on their faces is profound – and it lasts! Prayer and EFT work every time. Yoga takes the focus away from the conscious mind chatter and shifts it onto the body posture that we need to maintain. I have been teaching yoga and meditation for 26 years and I can’t agree more. I use water aerobics for exercise and to keep me limber. I have some difficulties with Yoga so this is a good substitute for me. It certainly helps my mood as well as my body. I am a dance/theater artist who lives in Seattle, Washington. I practiced my medium rigorously until I was 34 years old, choreographing and performing often. Then suddenly, I began having epileptic seizures. As you can imagine, the identity crisis which accompanied this experience added to its trauma. As I discovered the limitations and problems attached to the conventional medical responses to this disease, I began to explore alternative options. One of the the things I did was integrate yoga and meditation more fully into my life. Both of these practices quickly made a recognizable difference in my health and well-being. My seizure activity decreased noticeably, and my ability to live a healthy life walking with a chronic illness became possible. I talk about this in the book I wrote about my experience living with epilepsy. It’s called “SEIZED – Searching for Health in the United States”. You can find it on amazon.com. Sounds nice! I really want to try yoga, but I’m not good at tainkg a class continually for MYSELF. So I sometimes try yoga at home before sleep. That makes me so relax. I do Pilates and Qi Gong (Chi Gong), and I wonder whether these might have the same effect as Yoga, as they also require concentration on the posture or movement. If you’re interested in trying yoga I would suggest going to lots of different classes until you find one that works for you. While you might find that one particular style is more suited to your body, interests and needs, I suspect you’re more likely to find that it’s the instructor that makes the difference. Find somebody you like to work with and that will be the style that’s appropriate for you. Yoga may be more effective than walking not because of the exercise itself but because yoga demands that one focus the brain and be present to the moment. In contrast, when walking, one can still ruminate and rehearse the same old destructive thoughts and emotions, actually increasing anxiety and a negative mood. Yes, I developed a program for children using relaxation, visualization, imagery and positive self talk. Recognizing the feelings in the body is an important aspect of the therapy along with breath work. A study was done using this program with the children who lived through the horrors of Katrina by Dr. Lendell Braud who used both an experimental group and a control to determine the effects. Those who used the program for 3 months made numerous positive effects versus those children who did not and still suffered from flashbacks. We presented this study at the American Psychological Association meeting in New Orleans in 2006. I can provide a copy of this study to those who may be interested. Thank you for this opportunity. I will be working with at-risk youth using animal therapies both with horses and dogs. The yoga exercises would be wonderful to use for the self-awareness portion of our visits to the facilities. These children faced daily trauma in their lives and are being taught how to live their lives outside the cycle of abuse. I would love to hear more about your work with horses, dogs, and children. I applied to Bergin University of canine studies for the fall with the intention to work with dogs and youth at risk. My email is jakeasla1956@yahoo.com. so I simply use world wide web for that purpose, and get the newest news. Thank you for your generosity. I would love to read the study. I am planning to offer a program to children at the elementary school involving a number of different exercises and approaches to give them tools to maintain and increase well being. It would be wonderful to have a study that used similar approaches. Hi Mimi, your ptogram sounds wonderful. I have been using elements of these and would love to look at an integrated approach. I work with kids who presents with behavioural issues, resulting from traumatised environments, ADHD etc. Please send me a copy of your study: magda.dekock@education.govt.nz. Hanna Somatics targets 3 unconscious reflex patterns – one of them is anxiety. Hanna Somatics intentionally engages the pattern by focusing on the internal sensations of the subtle movement. Flexing the pattern and relaxing the pattern with awareness and control overrides the chronic contraction if anxiety. It’s as natural as a yawn. You can do it laying down, sitting or standing. Dr Hanna’s simple, yet profound, method maintains a deep level of muscle function – mind body awareness – that is missing in most forms of exercise, including yoga. The other two reflex patterns are stress and injury. Dr Hanna trained his first group of educators in 1990, and he died in an auto accident the night before the last day of class. Thus, his brilliant work has progressed at slower than a snail’s pace. I will be giving a workshop in Comnecticutt in October. I’d love to have you participate. When and where? I would like more information on your workshop. Where and when? I will be there! Glad to see the exercise factor focussed on in your program. Health care professionals often promote this as one element of treatment. This is indeed interesting results. I assume yoga would have much the same effect as meditation and other mindful exercises. I practice Taichi which also fits into the mindfulness domain and I experience similar results. Mindfulness exercises of any kind are the way to go to experience inner peace and world peace. I’ve used walking and deep breathing extensively to help me recover from cancer and stay well. Yoga is great and as you say, it provides physical exercise, mental relaxation, and deep breathing – it’s a combination that works. As well it’s a bonus to know how to do the deep breathing as this can be done anywhere, any time and helps us to have a stress buster in any situation. Yes! I have developed a workshop for children and their parents working to lower their anxiety that uses both yoga, mindfulness and brain science. The time together in the workshop is spent learning about the connection between what the brain is designed to do (fight or flight) and how to calm your body through yoga, mindful practices and the awareness of the breath. Really fun and effective way to improve mental health. As an Osteopathic Chiropractor, I greatly value the mind-body connection & also body-oriented approaches to facilitate & enhance the body’s own self-healing mechanisms. I greatly value walking & can appreciate the results of the studies on Yoga, also. At some stage, this year, I may well take Yoga up. Thank you, Ruth, for your timely reminder. I have found that my awareness of ´Jesus inside my heart´and meditating on His Presence in me, has given me a deep inner peace. This has helped me to face and overcome huge problems as well.I practice this in my therapies with clients and they learn to do the same with great results. This is the practice that I also use. Sometimes I feel intensely loved by God, and I bask in that love, sending it back to God, and out to other people. In the light of God’s love, all my earthly problems and concerns seem more tolerable and more manageable. I have always used tucking myself away in private dominion and painting from the space I am in. It has cleared a lot of pain and problems.